RRS James Clark Ross is on route to Rothera, the largest British Antarctic Survey research Station. In the next few hours to get to the base she will have to pass what looks like a continuous sea ice band about 15 km wide, before she enters some looser pack. To get their she will have to do some icebreaking. The band of ice has been stationary for over a week. If you want to follow the action the ship has a webcam, or you can check the Radio Office Mike Gloistein's update page. The web cam is as I write this but I'm sure it will be switched on soon. The satellite image is from 25 November 2016, but the sea ice doesn't look like it has changed significantly since then. I chose that date simply because it is relatively cloud free. The ship has about 130 km to run so could dock later today - but it could be tomorrow given the sea ice. The path I have shown in red looks quite a long way south of the Island - but close in it gets quite shallow. If your interested in your polar history the ship RRS John Biscoe was actually abandoned in this region for a while before being rescued by the German ship Polarstern. 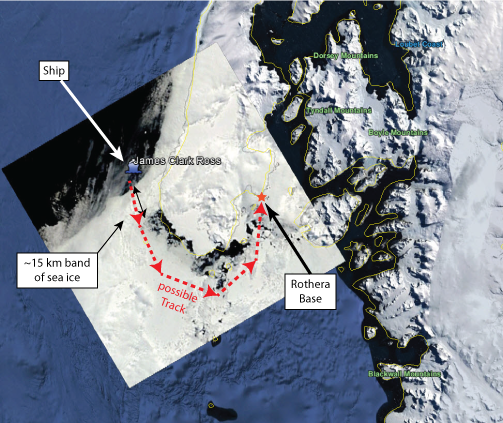 This is as The Antarctic Report points out, quite early for the ship to reach the base. The track of the ship is online along with the weather conditions it is experiencing. At at about 0°C it is currently warmer than a lot of the UK. Dr Helen Jones is the doctor on the James Clark Ross and she is writing a blog Baby it's cold down here. You can see James Clark Ross is now in the ice and heading for the band of relatively open water at the southern tip of Adelaide Island. This is an image from the webcam. I wrote about what a water sky is a while ago. It was too early and the RRS James Clark Ross didn't make Rothera. Posted in Science. Tags: antarctica, British Antarctic Survey, James Clark Ross, Rothera, sea ice on November 28, 2016 by Mark Brandon. I've been watching the open water down the eastern side of the Antarctic Peninsula. I said the cause of that was most likely strong westerly winds. If you look at the sea ice concentration on the western Antarctic Peninsula you can see the effect of these westerly winds. Towards the end of September 2016 the ice edge is compacted as the sea ice is pushed against the Peninsula. The westerly winds (from bottom left to top right) compress the sea ice against the land (left hand side of the Antarctic Peninsula). This also creates open water on the eastern (right hand side ) of the Peninsula as the sea ice is pushed away from the land. 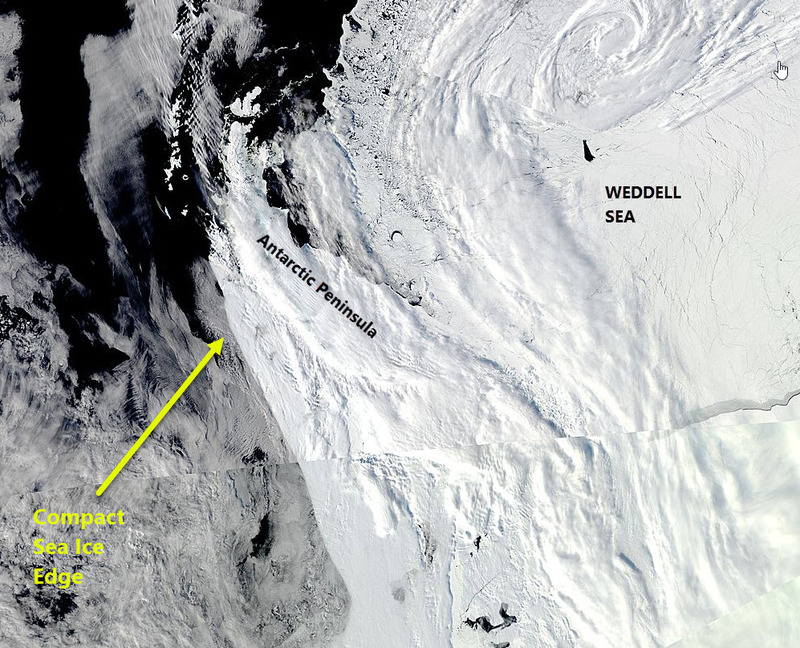 You can see the very sharp ice edge on the west, and the open open water in the MODIS satellite imagery. MODIS image of the Antarctic Peninsula 5 October 2016 from the Aqua satellite. The sea ice concentration anomaly for September 2016 shows that on both sides of the Antarctic Peninsula the westerly winds have reduced the amount of ice we would expect to observe by up to ~40%. On the west side because the sea ice is compressed, on the east side because the sea ice is being pushed away from the land. This is just late winter weather. 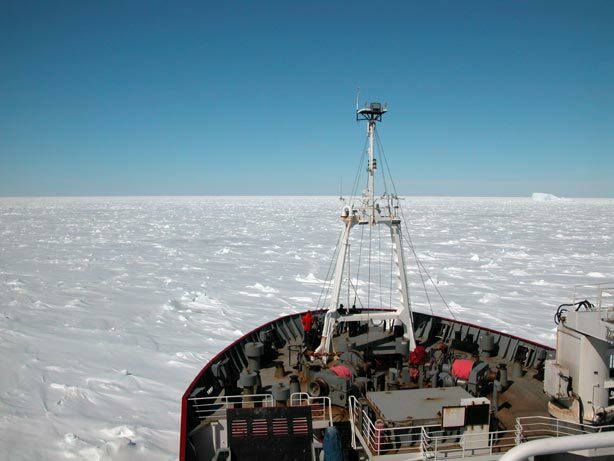 RRS James Clark Ross making very slow progress in compressed sea ice in Marguerite Bay, the Western Antarctic Peninsula 11 December 2004. Posted in Science. Tags: Antarctic Peninsula, James Clark Ross, Marguerite Bay, Rothera, satellite, Science, sea ice, Weddell Sea on October 6, 2016 by Mark Brandon. 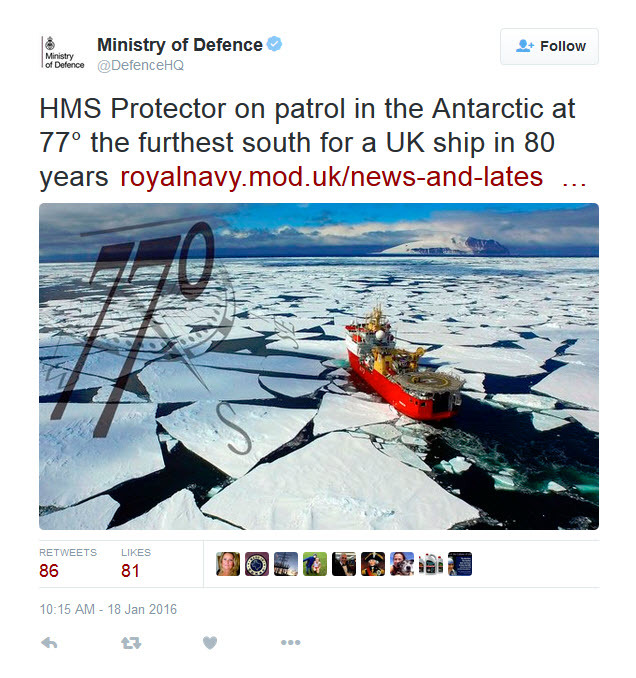 This just on twitter from the UK Ministry of Defence about the recent magnificent voyage of HMS Protector. By visiting this region Protector achieved a latitude of 77 Degrees 56 Minutes South – the very edge of the vast Ross Ice Shelf, named for James Clark Ross who led the exploration of the area. No official British ship has been this far south since 1936 and it is believed not since James Clark Ross’s own expedition in 1842. I don't think this is true. 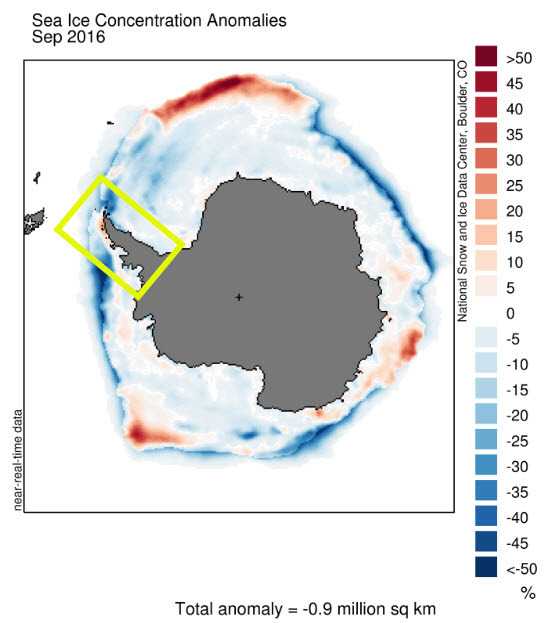 The British Antarctic Survey Ship RRS Bransfield reached likely a little further south. According to this note from the Second Officer Chris Elliot which is published on the website The LOFTSMAN which is about the shipyards of Leith. 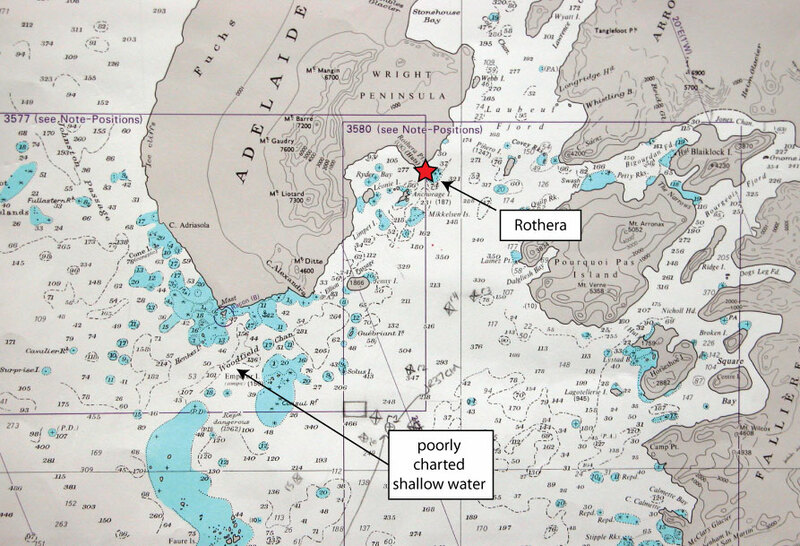 RRS Bransfield reached 77°56' 44"S.
So 44 seconds further south than HMS Protector. Which is what? 1.3 km? I know it's not much further south and Protector likely matched it (they don't give their decimal). I just wanted to make the point that it is close. Very close. The second officer in the note - Chris Elliot went on to become the Captain of the RRS John Biscoe, and then he was a member of the team that built the RRS James Clark Ross for many years, before becoming one of the Captains of that great ship. UPDATE See comment below by Radio Officer of the RRS James Clark Ross Mike Gloistein. Posted in History, Science. Tags: Antarctic, British Antarctic Survey, HMS Protector, James Clark Ross, trivial on January 19, 2016 by Mark Brandon. The cod icefish re-discovered and published in 1904 by Louis Dollo. The original caption says “Mangé par le chat de l'équipage de la Terror” or “Eaten by the Terror’s cat"! The famous polar ships HMS Erebus and HMS terror had been in the ice long before Franklin took them to their doom in the Northwest Passage. James Clark Ross took them to the Antarctic from 1839-43 on a hugely successful voyage to find the South Magnetic Pole. 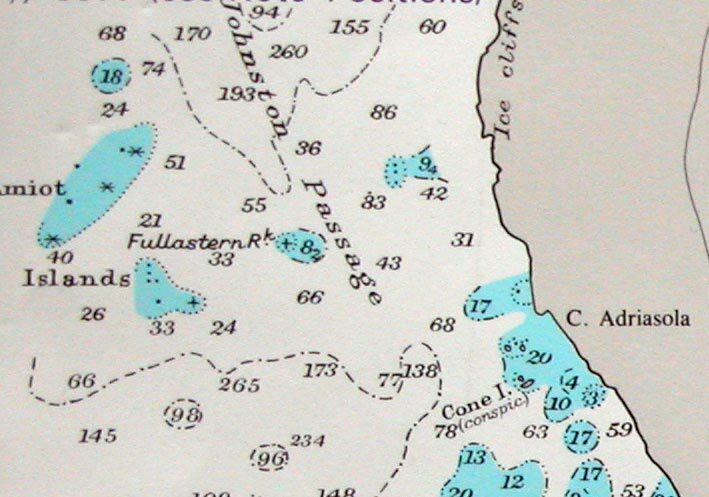 Ross filled in many blanks on the map and discovered and named many places including Ross Island and Mount Erebus - one of the most spectacular volcanoes yet discovered. Ross also took civilian experts to describe and write about their discoveries. These civilians produced vast scientific volumes to record their results. Posted in History, Science. Tags: antarctica, Belgica, HMS Terror, Ice fish, James Clark Ross, Science on June 14, 2014 by Mark Brandon. It was taken by Doug, who was then the Third Officer of the James Clark Ross, and I think that I was probably standing on the bridge with him and my two colleagues Dr Geli Renner, and Dr Paul Holland. We were the night shift on a research cruise in the Bellingshausen Sea. Posted in At sea, Science, twitter. Tags: antarctica, Beaufort Scale, James Clark Ross, Science, Sea state, storm on March 1, 2013 by Mark Brandon.